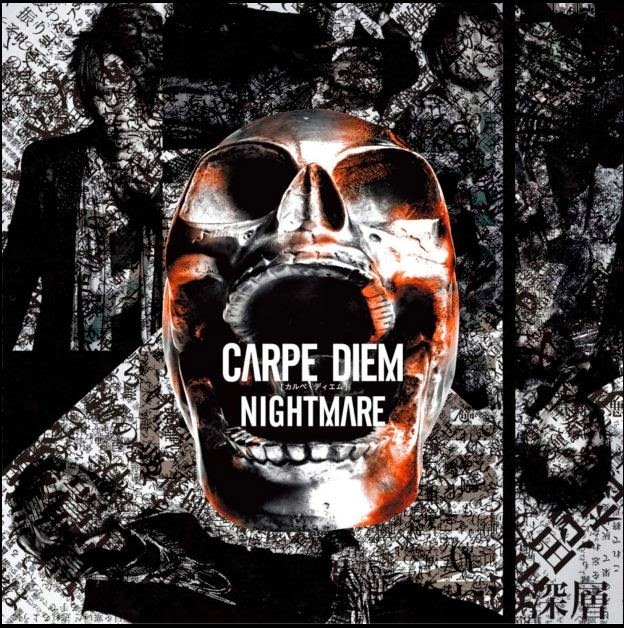 REVIEW: Nightmare's Carpe Diem | VKH Press – J-Rock & Visual Kei Coverage Worldwide! Never one to let an opportunity to release music go by, Nightmare has been having a crazy few years. Their last real break was between their Nightmare and Scums album cycles and have been releasing music constantly since then and one would think that this has had an adverse effect on their creativity, but it hasn't. Some might argue that their music has gone downhill since the good old days of The World Ruler and Killer Show, but that's definitely not the case... At least not completely. The band's (roughly) 14th album begins with a track that's quite epic and different from their more pop/punk sound as of late. It's significantly darker in terms of composition and gives the listener a sense of imagery. By which I mean, the song paints a pretty vivid picture of the point it is trying to get across. "Siva" is a song that you will want to listen to again and again for the sheer fact it has some of the most powerful vocals on Yomi's part in the last 6 or more years. Also, the song is structured to specifically not be too repetitive. The 5.5-minute song has different movements, returning to the original structure semi-frequently. A genius composition. "Boku no Kirai na Kimi ga Shindara, etc," is a bit more of a return to recent form. A lot of their music recently has been catchier and more oriented in a pop/punk sound than purely Visual Kei or general rock music. This song is a testament to that. While I could see the song being described as generic or more general rock due to the fact that it doesn't have anything that immediately grabs your attention as new or different for this band or any band in particular, that doesn't distract from the fact it is pleasurable to listen to and has a good melody and beat. The follow up to this song is another punk/rock banger called "Taboo" which was used as the lead single this era and was widely criticized at first for being "too quickly released" after the To Be Or Not To Be era ended and also for it being too generic, but in the 9 months since its release the song has grown on me some. While I feel the composition leaves a lot to be desired, with the exception of the guitar solo around 2:20, the vocals are spot on and create a fun environment of which fans can really enjoy a recording or a live performance. Track 4, "Koukotsu," keeps the fast-paced air of this album going with heavy electric guitar use and minimal vocal tricks. The verses are incredibly sung, but the song turns messy with the chorus. It all becomes too frantic and the energy just spirals out of control until they reign it in a little bit for the second verse. However, the song continues on this pattern of inconsistent greatness that makes it a song you're either going to love or hate. The promotional song, or third single, from the album, is track 5: "Quints." While the only notable part of this song is the chorus and how it's got a powerful melody and harmony, the rest of the song sounds a little bit all over the place. There are several things going on at any one moment which I suppose is the mark of a typical punk/rock song. I'm aware of many Nightmare fans really loving this song, I may just be the odd man out here, but if they would have toned down the amount of different compositional ideas, the song would've been pretty great. "Nyuumetsu" almost ruins the pace of the album. Not to completely oust it as a good fit for the album as a whole, it's just a big change of pace from five consecutive songs of intense energy. Track 6 is not only different for the album, but a little bit different in general for the band. The vocal effects used on Yomi on this tune allow him to sort of blend in with the instruments instead of being the absolute focal point. The best aspect of the song is the harmony between the two guitars. The instrumentals are what drive the point of the song home, but if you're not one for ballads or songs without much energy or feel, you probably won't enjoy this one. The second single from the album was my personal favorite as it was straight up pop/rock. This song is incredibly radio-friendly and can be enjoyed by people who aren't even fans of Visual Kei let alone Nightmare. "Blur" even has a bit of an electronic influence that sets up a feeling of a mid-tempo ballad rather than an outright rock song. Can't say enough positive things about this song, even it's B-Sides (which, unfortunately, idn't make the album) were very special. I would recommend checking out "Such a Nonsense System" in particular. "Demand" is a total departure from the nature of this album. It's killing me, but I can't seem to think of the sample that they used in this song. It reminds me of a ballet, possibly "The Nutcracker," but I can't be certain. In any case, they take this very classical composition and bring it into the 21st rock'n'roll century. The song is incredibly dissonant and downright weird, if I'm being honest. The song is totally not mainstream, a complete 180 from the album's predecessor, but the good thing about it is that it deviates enough from the norm that it can be considered something memorable. Now, on to possibly the best song on the album. "Nameless" is everything you want from a band called Nightmare. It's got heavy rhythm guitars and a generally dark feel throughout. To call this song a headbanger would be appropriate. While the vocals are generally pretty mainstream (i.e. sung powerfully with no filters or tactics like screaming), the heaviness of it wouldn't fly for the radio which I'm sure is what fans are expecting this era. The next song doesn't even sound like the same singer to the point where if his voice didn't change in the middle of the song to something so distinctly Yomi, you could have told me it was anyone and I would have believed you. Otherwise, the song is very nice, but that's about it. "Fade" is certainly more on the brighter or upbeat side and is a standout due to the lighter vocals and composition, but realistically it could blend in with almost any rock song in the industry today. "The Dool" is the definition of filler. It's less than a minute long and is just a constant barrage of drums and vocals. The guitars are certainly not the focal point here, not to mention when they do appear they aren't very good. I'm really totally unsure what they were trying to do with this number. I'm assuming the next song is a part of a new series of songs they're doing a la "Gianism." "Gokujou no Shinrengoku (Nishiki)" is likely a follow up to last year's "Gokujou no Shinrengoku (Yi Shi)" and it's decently easy to tell. They're both fairly haphazardly composed with vocal filters and not much to write home about. To be fair, I didn't care much for the "Gianism" series either. "Tao" is a great album closer, but doesn't live up to previous album closers. While this is just my personal feelings, I always find the way an artist ends their album to be the most important and Nightmare is generally pretty consistent with delivering great closers and "Tao" is not a bad closer, by any means. It has all the essential elements of a pop/rock song (easy to listen to and digest, great vocals, an air of complex simplicity), but doesn't exactly go the extra mile to sum up the album. Regardless of how different each individual song was, the album as a whole was solid. Carpe Diem will likely go down as one of their better albums. They've created a piece for their very wide and varying fanbase to love and appreciate in their own way which is extremely important to any band's career. If you would like to check out this album for yourself, please purchase it through CDJapan.